Luís Soares Barbosa is Deputy Head of UNU-EGOV. He is also Associate Professor with Habilitation at the Department of Informatics at the University of Minho. He is also senior researcher at the High Assurance Software Laboratory at Instituto de Engenharia de Sistemas e Computadores – Tecnologia e Ciência (HASLab INESC TEC). 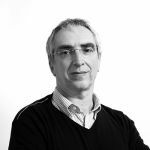 In recent years he has coordinated six research projects at the national level, bilateral partnerships with Brazil and China, and served as the Portuguese coordinator for the Language Engineering and Rigourous Software Development ALFA EU-Latin America network. He coordinates the PF-FLAD Chair on “Smart Cities & Smart Governance”, established at the University of Minho with private funding. Barbosa, Luís, Layered Logics, Coalgebraically First International Workshop on Dynamic Logic: New Trends and Applications, Brasília, 2017/09/22. Carvalho, Nuno and Barbosa, Luís, Transforming Legal Documents for Visualization and Analysis 11th International Conference on Theory and Practice of Electronic Governance (ICEGOV2018), Galway, 2018/04/04-06. Paulo Santos, Luís, Nuno Barbosa, Luís, Bessa, Diogo, Martins, Lúcia and Barbosa, Luís, Communities of Practice as a tool to support the GCIO function 11th International Conference on Theory and Practice of Electronic Governance (ICEGOV2018), Galway, 2018/04/04-06. Barbosa, Luís, Digital Governance for Sustainable Development 16th IFIP WG 6.11 Conference on e-Business, e-Services, and e-Society (I3E 2017), New Delhi, 2017/11/21-23. Barbosa, Luís and Santos, Luís, Networks of Universities as a Tool for GCIO Education IFIP EGOV-ePart 2017, Saint Petersburg, 2017/09/04-07. Nielsen, Morten M., Carvalho, Nuno, Veiga, Linda Gonçalves and Barbosa, Luís Soares, Administrative Burden Reduction Over Time: Literature Review, Trends and Gap Analysis 10th International Conference on Theory and Practice of Electronic Governance (ICEGOV2017), New Delhi, 2017/03/07-09. Fernandes, Sara and Barbosa, Luís Soares, Electronic Governance in Portugal: A Silent Pioneer 3rd International Conference on Electronic Governance and Open Society: Challenges in Eurasia (EGOSE ’16), Saint Petersburg, 2016/11/22-23. Gonçalves Veiga, Linda, Janowski, Tomasz and Barbosa, Luís, Digital Government and Administrative Burden Reduction 9th International Conference on Theory and Practice of Electronic Governance (ICEGOV2016), Montevideo, 2016/03/01-03. Estevez, Elsa, Barbosa, Luís and Janssen, Marijn ed. Proceedings of the 8th International Conference on Theory and Practice of Electronic Governance (ICEGOV2014) 2014/10/27-30 Guimarães. Guimarães: ACM Press, 2014.